During the Senate Judiciary Committee's hearing on the Supreme Court nomination of Judge Brett Kavanaugh, Booker threatened to release confidential documents relating to Kavanaugh's service as a lawyer in the George W. Bush administration. 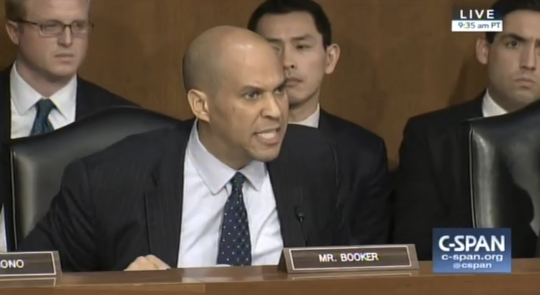 "I understand the penalty comes with potential ousting from the Senate," Booker said before releasing Kavanaugh's old emails, adding, "This is about the closest I'll probably ever have in my life to an ‘I am Spartacus' moment." After the display, however, the Washington Post reported that the "confidential" emails were already cleared for public release before Booker's dare, citing both Democratic and Republican aides on the judiciary committee. When Wall Street Journal reporter Byron Tau asked Booker whether his actions during the morning session were a stunt, the senator accused him of violating the U.S. Constitution. It is not entirely clear what Booker was referring to, but the Speech or Debate Clause of the Constitution does state that members of Congress cannot be arrested on their way to session and "in going to and from [session] … shall not be questioned in any other Place." The prohibition against "questioning" lawmakers on their way to session, however, has generally been interpreted to apply to law enforcement, not reporters. This entry was posted in Politics and tagged Brett Kavanaugh, Cory Booker, Supreme Court. Bookmark the permalink.